The Bottle Palm is one of the most threatened species of palm in the world, native only to the small and secluded Round Island, and incredibly difficult to grow elsewhere. The Eden Project contains two of these rare species, which are nigh on impossible to grow without the use of climate control in this country. The palms are several feet tall, with a few palm fronds (about 4 -6) and a set of flowers that will sprout from under the crown. The most recognisable feature of this plant is the strange warping on the bottom of the trunk, which is similar to a bottle and has given rise to the rumour that it stores water in this part of its trunk. These rumours are nothing more than folktales, and there is no need to chop them down to get at their water. The Bottle plant is immensely endangered due to the fact that prior to being exported to America it only grew on Round Island, which lies just off the coast of Mauritius. Its detachment from any mainland for so long, along with the fact that even a slight frost is capable of killing it, means that at the present time the only place it can grow without any aid are in the tropics, where it has been planted to prevent it from dying out. The Bottle Palms still living on Round Island are under threat from forest destruction, but these specimens assure its survival for the future. It’s one of the most endangered species of palms in the wild, and I am always in favour of the preservation of any species for future generations. It is heartening to see that measures have been taken to prevent its extinction. 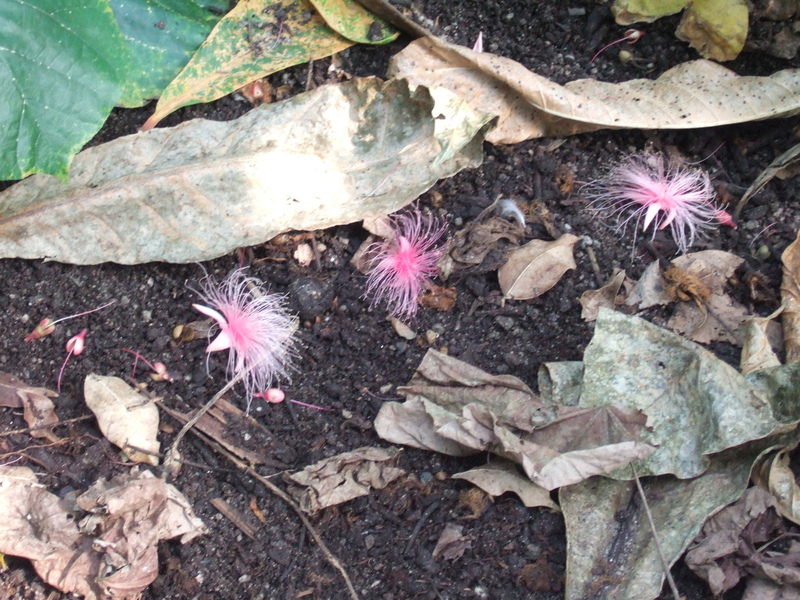 These beautiful pink flowers belong to a strange plant known as the Fish Poison Tree, or the Barringtonia Asiatica, which is native to the Philippines and other oceanic islands. It is particularly associated with a small Polynesian island, named Futuna after the native name for the plant futu. I saw on of these plants in bloom at the Eden project, where its fluffy pink-white flowers had just begun to drop off the tree. As its name suggests, every part of this tree is poisonous and although it is not poisonous enough to kill a human in small quantities, grinding the square fruits of the plant can produce a powder capable of stunning or killing fish. It was used by indigenous peoples in order to help feed their groups, although it is rarely used today. These plants are easy to recognise, either by their cuboid fruit or the sweet smelling pom-pom like flowers. A fully grown tree will reach about 20 meters into the air, and has a large area of coverage from the branches, which causes it to be planted in some countries as shade and decoration. In India this tree is often used for such purposes. The fruit, which is sometimes called a Box Fruit on account of its shape, is light and buoyant, allowing it to float easily on water. In this way it disperses in the same way as the Sea Bean and the Coconut, floating across the ocean until it washes up on land suitable for it to grow. Like the coconut, the seeds in the fruit can remain dormant for nearly 15 years, waiting for the right moment to begin sprouting. This means that the plant is widely dispersed over any area that it is able to grow, and is often one of the first plants to arrive on newly formed islands. The plant was certainly beautiful, if somewhat dangerous to eat, and its method of distributing seeds is interesting. In particular it reminds me of the Sea Bean Pod, which is one of my favourite plants for the same reasons. Now that I know what this plant is, perhaps I will recognise it next time I see one. 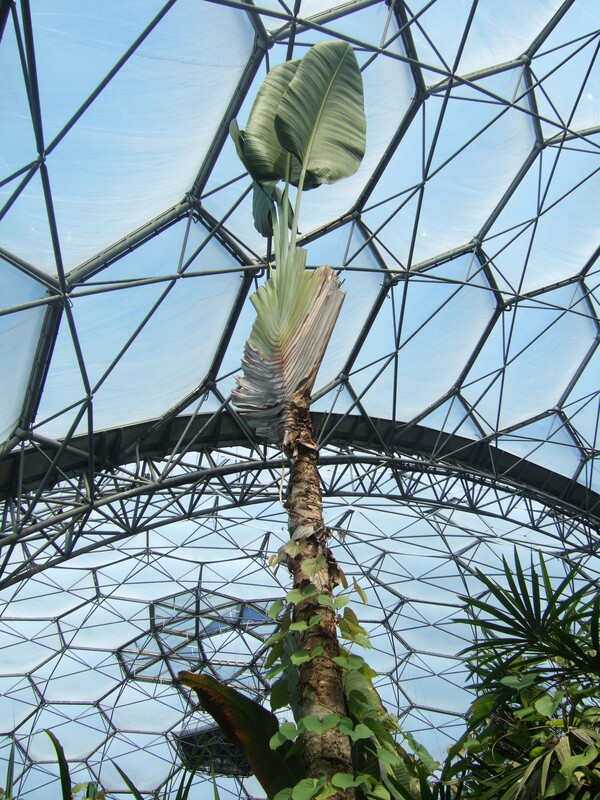 This towering pillar of bark and leaves is a young Traveller’s Palm, one of the many trees that can be found in the Eden Project. This one is fairly young, with only a few of the large frond leaves that make it so iconic sprouting from the tip. As it matures those leaves will spread out into a fan, the outer leaves of which will fall of to reveal more bark underneath. 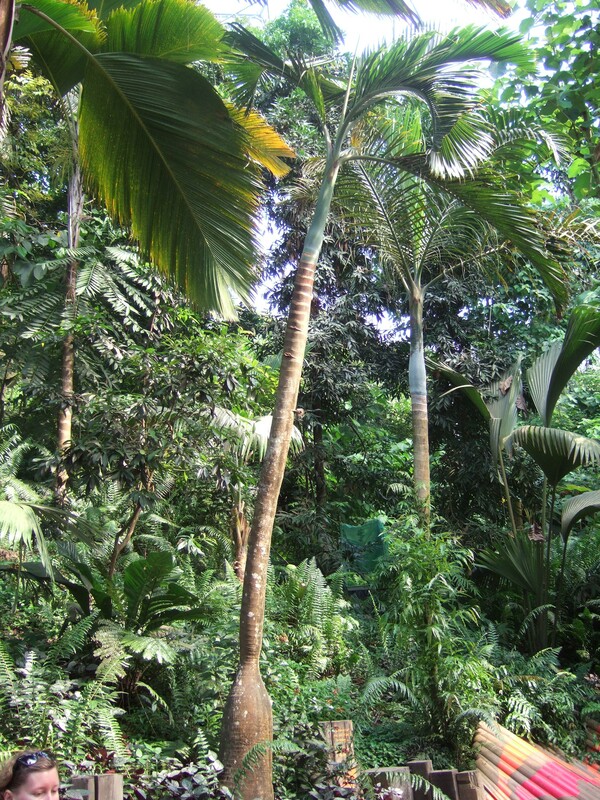 These trees reach heights of about 7 or 8 metres, and the fan of fronds can reach the same distance across in a large specimen. It’s need for large amounts of nitrates and sunshine mean that the rainforests of Madagascar, of which it is native to, are perfect for it to grow, although many of them are used as decorative plants in the west coast of California, where conditions are also ideal for their growth. They sprout small white flowers with large protective leaves, and produce small, blue pod-like seeds. It is strange that this plant is called the Traveller’s Palm given that it is neither a palm nor helpful to travellers. It is, in fact, a bird-of-paradise plant similar to those found in central Africa, that are used for ornamental purposes in gardens with hot climates. The idea that it is helpful to travellers comes from the thought that water can be stored in the stems of the fronds, and therefore drunk by thirsty explorers. Sadly, the water in the stems of these plants is cloudy and dangerous to drink without purification, and it is likely that someone who drank it would lose more water from vomiting than they gained from drinking it. Bizarre as the plant may seem, it certainly strikes an imposing figure in the forests and jungles of Madagascar, where it is thriving. I quite look forward to seeing this plant when it is fully mature. This Roul Roul, that goes by the ridiculous scientific name of Rollulus Roulroul, was one of the interesting creatures used to populate the rainforest biome at the Eden Project. 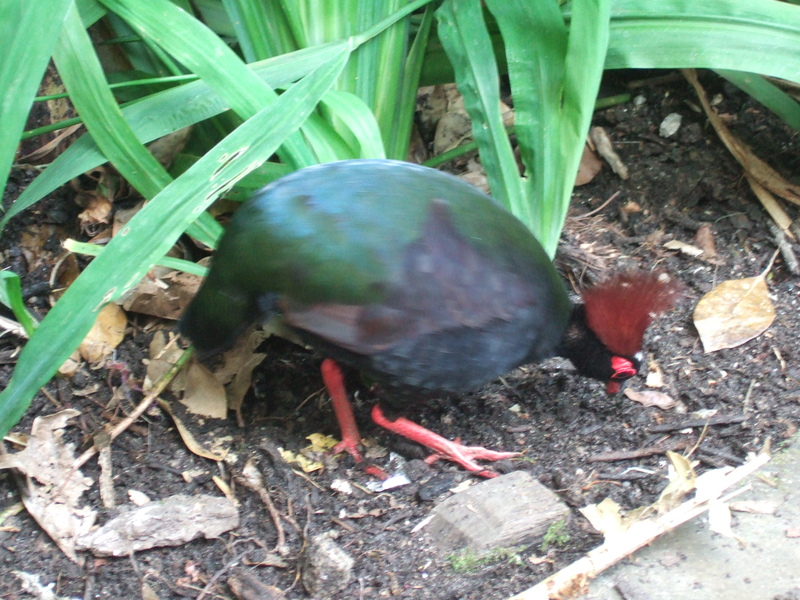 The Roul Roul is a type of pheasant native to South Asian and Oceanic rainforests, such as Malaysia and Thailand. They are about 20cm long, with males reaching up to 25cm. The males are distinctive by the bright red crest on their head, as pictured above, which they grow shortly after they are born. They also have a black head and underbelly, where the females have an olive green body and a dark grey head. The Roul Roul will travel in packs of 30 – 50 at the very largest, searching the forest floor for fruit, seeds and small invertebrates that they scratch out with their claws. They have been known to follow herds of wild pigs, such as the Barbirusa native to Indonesia, as they move through the forests in order to eat the leftover fruit. Roul Roul are ground nesting birds, and build their nests like domes out of leaf litter, created so that it is impossible to see the female from the outside. This gives the birds a serious advantage against predators in the rainforest, such as civets. Once a pair of birds mate and make a nest, they are paired for life, and while the female incubates the eggs, the male will go out hunting and gathering for both of them. The features of young Roul Roul are identical to those of the adults, although their feathers do not yet have the same glossy sheen. These birds young are fairly precocious, but unlike other birds that mature young, Roul Roul will be fed by their parents and live in the nest for a while before joining the group. These funny little birds really brought the Eden Project’s rainforest area to life, giving the interesting plant life little rustles of movement that kept the wild atmosphere. They are unusual, exceptions to how birds of this kind normally behave, and I feel that there is more to be learnt about them.